For some, virtual reality (VR) hasn’t gone fully mainstream because of the full cost of entry. 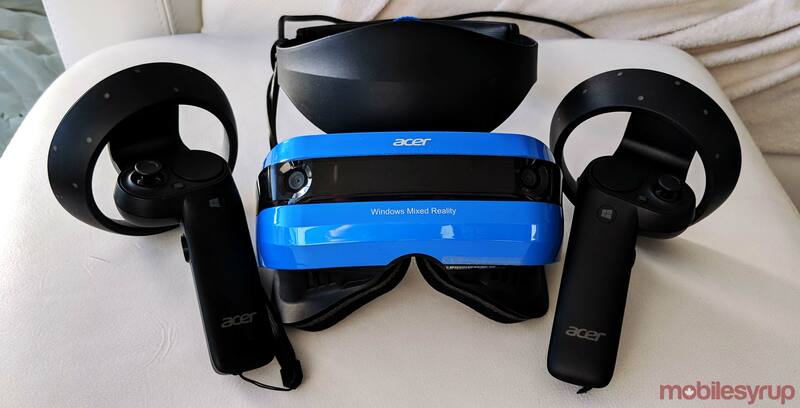 Windows Mixed Reality headsets are designed to make it more affordable and accessible, but there are trade-offs along the way. To be clear, the term ‘mixed reality’ is little more than marketing lingo. This is VR. Microsoft’s HoloLens technology aims to bridge the gap between VR and AR (augmented reality), but that’s different. 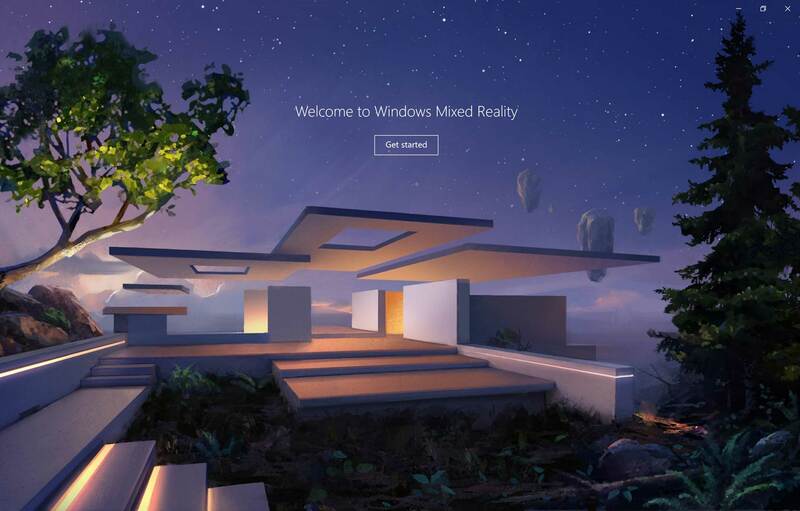 Windows Mixed Reality is an ecosystem of products, made up mainly of headsets, that can work with PCs powerful enough to run the content. MobileSyrup’s Bradley Shankar’s hands-on previously outlined what the experience was like prior to launch. 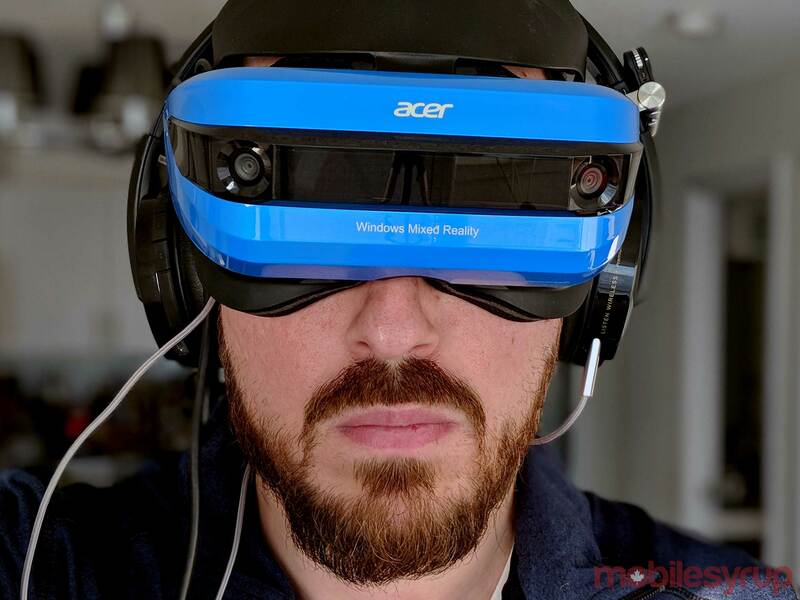 I got to test it out at home using the Acer Mixed Reality Headset AH101, and came away feeling mostly positive myself. To do this, I needed a PC capable of running everything, so I went with an MSI GS63VR 6RF Stealth Pro gaming laptop. Running on a Core i7 with Nvidia graphics and 16GB of RAM, it had the juice to handle things. Ideally, it would’ve been great to try it with an Intel 8th-generation Coffee Lake chipset, but I managed fine with a 7th-gen chip. One thing about PC gaming laptops is that port configurations can vary. Case in point, this MSI laptop had the HDMI and USB 3.0 ports — both cables the AH101 uses — on opposite sides. The ports were too wide apart for the cables to reach, so I had to use the HDMI cable from the original Google Chromecast as an extender to create just enough slack. It looked ridiculous, and made any serious typing null and void. Since I didn’t need to do much on the laptop itself when playing with the headset, it was more of an aesthetic issue than anything else. Microsoft had released the Windows Fall Creators update that included Mixed Reality a few months ago. Assuming you’ve done the updates, you would only need to plug in a compatible headset to launch it. I did notice a catch, though. Antivirus software could stall the update. After trying to troubleshoot what the issue was, I simply turned off the Norton Antivirus and all went ahead. I then realized that when antivirus software has expired, it could block the update completely. I can’t be sure it would happen with every PC running Windows 10, but it definitely happened in my case. With that out of the way, the Windows Mixed Reality app ran, assessed the specs, gave me the green light, and within five minutes, I was setting things up through the headset. Unlike the HTC Vive or Oculus Rift, the AH101 don’t need sensors mounted on a wall or on stands to map out the playing area. A pair of tracking cameras on the front do the heavy lifting, while the initial setup on the Mixed Reality software had me use the headset to literally draw out my playing area by walking around what would be my perimeter. An integrated gyroscope, accelerometer and magnetometer round out the positional tracking. Either way, you must have an area of at least 152cm x 213cm feet to play upright with movement. Otherwise, the only other option is to play using the settings for a seated-only experience. The lightweight design is the AH101’s biggest asset. I don’t like overhead straps, and this headset proved why one isn’t necessary. The padded headband situated nicely just below the crown of my head, and the dial nestled in it let me tighten or loosen the grip. The front of the headset flips up and down. Initially, I didn’t realize it was partially made that way to simplify sight in the real world. I thought it was adjustable purely for reasons of finding the right fit. This design tweak made a lot of sense during my testing whenever I had to get out and do something on the laptop. The headset has a 2.9 x 2-inch LCD screen with a resolution of 1440 x 1440 pixel per eye and a refresh rate of 90Hz. Mind you, that refresh rate only applies when using a PC with discrete graphics and an HDMI 2.0 port. When using a PC with integrated graphics and an HDMI 1.4 port, it drops down to 60Hz, which is barely good enough for more passive VR content. With my fully-loaded MSI laptop, I had the luxury of testing all this out under the ideal specs. 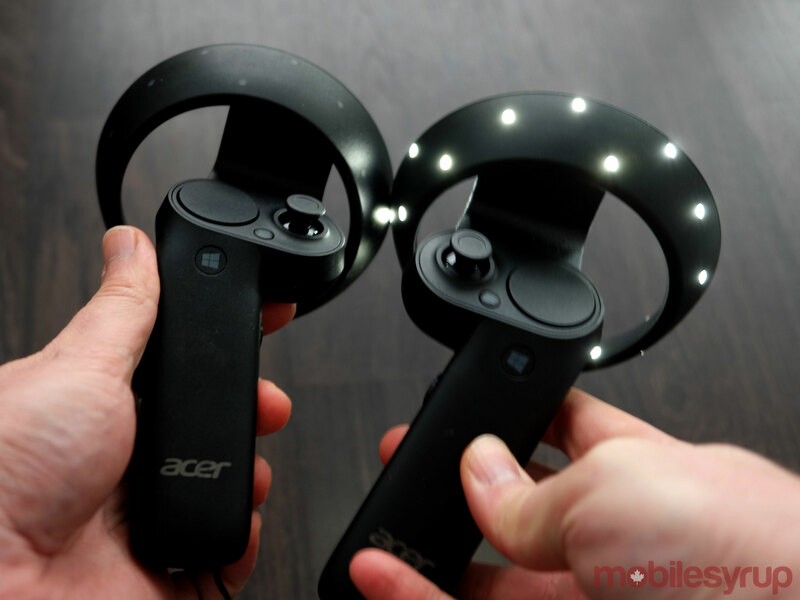 The controllers are somewhat similar to the Oculus Rift, and are ringed with LEDs along the top circular frame. The headset’s camera sensors track hand movements through those lights. The button layout includes an action trigger at the back, along with another grab trigger on the side. The main Windows button, which is both to power the controllers on and off and to go to the Cliff House virtual home, sits just below the touchpad. The touchpad and joystick are on the face at the front, with a menu button in between. Ergonomically, the layout works fairly well, with everything easy to reach, regardless of what size hands you have. Plus, they’re responsive. Microsoft made its Cortana voice assistant available in the Mixed Reality environment, but I found a few too many caveats. First, it works better when using headphones with a microphone. In those instances, wired earbuds with an inline mic worked better than over-ear pairs. Why? I have no idea. Second, basic commands were okay, but it didn’t always understand what I was asking for. I could tell it to show me my downloaded apps and games, yet faltered when I wanted to launch a specific one. Web searches through the Edge browser in Cliff House were also hit or miss. I eventually reached a point where I trusted the floating virtual keyboard instead, especially given how responsive it was. VR is in an early stage, which to my mind, gives it a bit of leeway in how immersive the content truly is. Having played with the Vive, Rift and PlayStation VR before, I came at this with some previous experience. The emotive feeling of the content is such that even a basic game can do plenty. Games that would be pedestrian on PC or console gaming are totally different. I’m stating the obvious for anyone who has tried VR, but for those who haven’t, the experience of seeing a game from a 360-degree perspective is substantial. The Windows Store has a decent breadth of content to go through, with my personal favourite games being Space Pirate Trainer and Superhot VR. I’ve always liked the deep sea experience of theBlu, and NextVR has some nice live recorded content to look at. I was less impressed with the Dunkirk VR Experience, not so much because of how it was produced, but more because of its lag and choppy playback. In light of all that, the AH101 doesn’t have the kind of clarity I’ve seen with the other high-end headsets. It was clearly better than a mobile-driven VR experience, like that of the Google Daydream View or Samsung Gear VR, making it somewhat commensurate with its price point. Generally, everything I played or watched ran well. There was some ghosting whenever I turned my head quickly, and I found the 100-degree field of view somewhat limiting, but it was acceptable, otherwise. I can’t dock the headset too much on this because VR simply needs more pixels to look sharper. This is why some games lack detail. But it works. 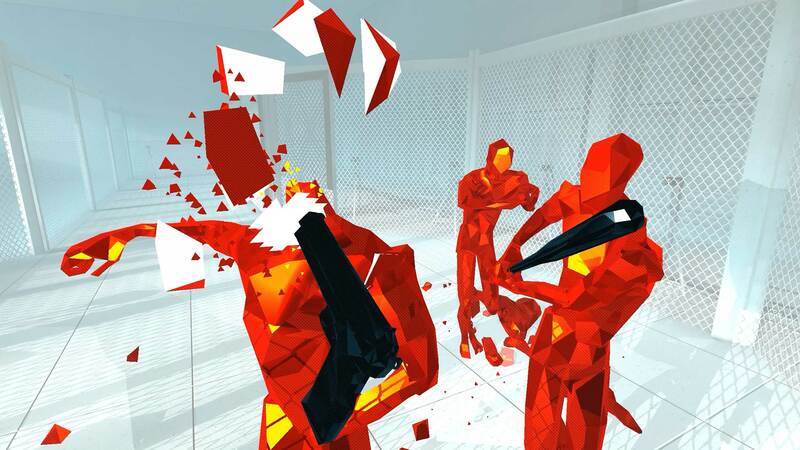 Superhot VR is very basic in how it’s laid out, yet I felt really engaged when playing it. However, I also played everything with the best specs for the experience. If I was lacking the graphics or processing power, I either wouldn’t be able to play, or it might not even be worth it to try through those limitations. It’s also a shame that there’s no AR to speak of here. The term ‘Mixed Reality’ suggests an effective mix of VR and AR, except that’s not the case at all. The front-facing cameras don’t peer out to bring in the real world and merge it with virtual assets. Perhaps they could from a technical perspective, but for now, that’s not happening. Without Steam VR, Windows Mixed Reality headsets simply don’t have the content library to compete with others. The best mix of games, apps and 360 video is available there. At the time of this review, Steam VR was available in beta, so results were mixed. This set of instructions gives you an idea of the foundational cracks they need to fill. You don’t have to install Steam VR using that process, but from what I noticed, doing it can help smooth things out. Even so, this is a non-starter for anyone new or lukewarm to VR. When setting up the headset feels like a plug-and-play process, it shouldn’t take hurdles to get to the best content. That will naturally change as the beta tag is removed and it all goes live. It’s just not there yet. The biggest reason Acer’s AH101 headset works is the simplicity in using it, and the current novelty of VR content. Friends who tried it liked how it worked and felt they had done something totally new to them. It’s not unlike how 3D graphics made an impact on gamers used to side-scrolling platformers back in the 90s. At $599.99, the AH101 is cheaper than the Vive, yet more expensive than the Rift, which dropped in price in the fall. It requires little to set up, and little upkeep, but does heavily depend on what PC you’re using (as any VR headset does). 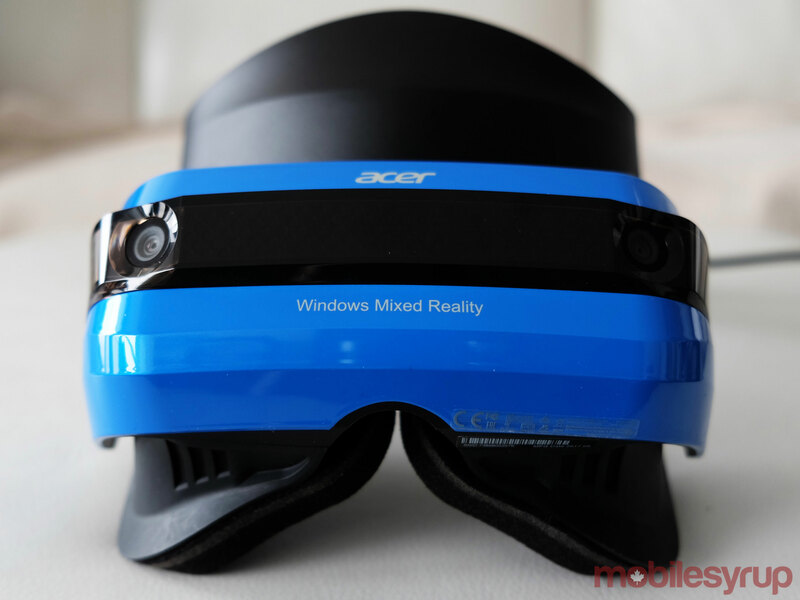 Acer and Microsoft have marketed as a versatile headset that can run on a variety of PCs. That’s true, but it comes with a degradation in quality and performance. The Rift is better value for the price. HTC has already unveiled the Vive Pro, with the intention of launching it this year. If money is no object, go for that when it comes out. If you already have a decent enough PC that can run with the AH101, you will like how easy it is to use. "The biggest reason Acer’s AH101 headset works is the simplicity in using it"